Bạn có thắc mắc về Mariya Boutique Residence à? Được tu sửa lại năm 2012, Mariya Boutique Residence bảo đảm mang đến cho quý khách sự hài lòng dù đang ở Bangkok để công tác hay nghỉ dưỡng. Chỉ cách trung tâm thành phố 20. Km, vị trí đẹp của khách sạn bảo đảm khách hàng có thể đến tham quan những địa điểm du lịch nhanh chóng và dễ dàng. Như một thiên đường nghỉ dưỡng và thư giãn, khách sạn mang lại sự đổi mới hoàn toàn, chỉ cách nhiều điểm tham quan trong thành phố vài bước, như Wat Plooksattha, Bệnh viện Lat Krabang, Wat Latkrabang. Tại Mariya Boutique Residence, dịch vụ hoàn hảo và thiết bị tối tân tạo nên một kì nghỉ khó quên. Những tiện nghi hàng đầu của khách sạn bao gồm dịch vụ phòng 24 giờ, miễn phí wifi tất cả các phòng, dịch vụ taxi, quầy lễ tân 24 giờ, giữ hành lý. Mariya Boutique Residence có 37 phòng khách. Tất cả đồ nội thất đều dễ chịu, êm ái, và thậm chí nhiều phòng còn cung cấp các tiện nghi như tivi màn hình phẳng, cafe hòa tan miễn phí, trà miễn phí, các loại khăn, dép. Khách sạn còn gợi ý cho bạn những hoạt động vui chơi giải trí bảo đảm bạn luôn thấy hứng thú trong suốt kỳ nghỉ. Mariya Boutique Residence là một nơi lý tưởng cho khách đang tìm kiếm chỗ ở có thiết kế tinh tế, thoải mái và thuận tiện tại Bangkok. Vui lòng lưu ý khách sạn có cung cấp dịch vụ đưa đón 2 chiều miễn phí tùy theo loại phòng (Chỉ dành cho sân bay Suvarnabhumi). Vui lòng gởi thông tin chi tiết chuyến bay hoàn chỉnh (đi và đến) khi đặt phòng. Nếu thông tin chuyến bay không được nêu rõ, khách sạn sẽ không thể bảo đảm việc đưa đón. Sau khi gởi thông tin chi tiết, khách hàng sẽ gặp đại diện khách sạn cầm bảng có tên khách tại điểm đón giữa Cổng 3 và Cổng 4 của Khu đến (tầng 2) bên trong ga. Trong trường hợp khách hàng không tìm được đại diện khách sạn Mariya, vui lòng liên hệ khách sạn theo số điện thoại in trên voucher. Một trong các nhân viên khách sạn sẽ đến gặp khách hàng trong vài phút. Và xe đưa đón sẽ đến trong 10 - 15 phút. We've been staying at Mariya for a couple of years - 5-6 times a year. We travel to Bangkok the night before a major trip , over night at Mariya and head out first thing in the morning. What we really like about Mariya (besides the free shuttle and great breakfast) is the staff. Internet has been great too. Great value for the money. Loved the coffee and snacks during the day. Free shuttle to the Airport was a real bonus. Preice I paid included 2 way transfer from/to airport. Lady was there with my name and arranged the transfer very quickly, nice van. Hotel room of a good size with a large super king bed, I had a good sleep on overnight stay. Restaurants and convenience stores nearby. Pubs, clubs also nearby. Very friendly staff. Only drawback is there is no lift and we were on 3rd floor but not really an issue as their is assistance available. Enjoyed stay and will probably stay again. I stayed here because I wanted a place close to the airport for an early flight. It was awesome for that because they have a shuttle and they asked when I needed to be there and gave me a a wake up call and everything. As I only stayed one night I didn't check out the surrounding area much but from the brief stroll around I took there didn't seem to be much going on nearby. If for some reason you did want to stay here for multiple days I'm sure you wouldn't be disappointed by the hotel in any way though, it's very nice. The room was clean and comfortable for a one night stay. The bathroom needed a bit of updating and my husband tightened a couple faucets that were extremely loose. Free transfer to airport was friendly and on time. Lobby was welcoming as was the staff. Plenty of restaurants (and 7/11) right outside the door. We would stay here again. The hotel is definitely a boutique hotel. The basic ammentities you would need as a layover airport hotel. At first glance, it may seem that it lacks food and drink options, but there are actually a lot of options along the highway within walking distance or a short taxi ride. The have a basic breakfast in the lobby which is not too bad. One inconvenience is that there is no elevator, so if you are on the 3rd or 4th floor with a lot of heavy luggage, a little bit troublesome to climb up and down the steps. 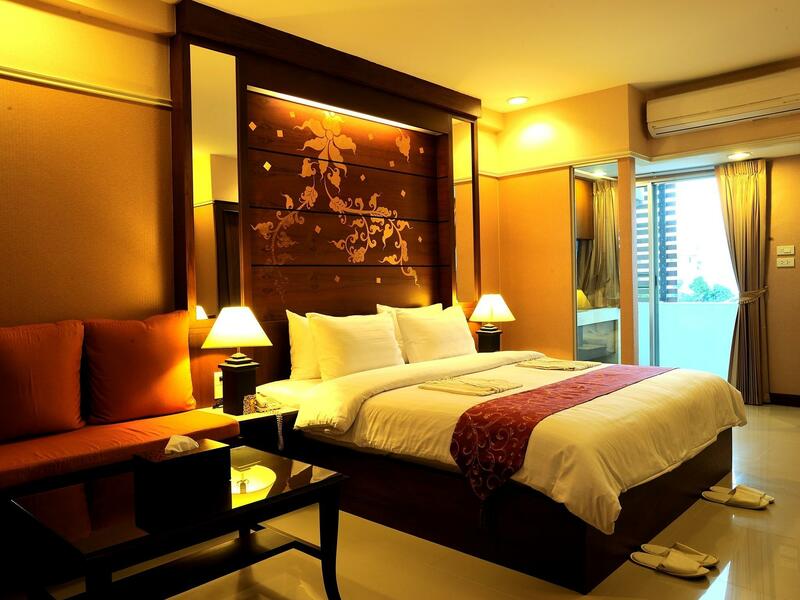 Choose this hotel if you need an affordable hotel for transit in Bangkok! The Hotel was very responsive when I asked for details for the pick up. My flight arrived in Bangkok nearly midnight and the staff was already stand by for picked me up. They also offer the transfer to airport the next morning. Room was spacious and decent. A mini market is just next to the Hotel. They have snacks available in the lobby and it’s free for everyone :) their WiFi works great and very nice & clean room. Only thing is that there are mosquitoes in their lobby area where the sofas are placed, hope they’ll do smt about it. But other than that the place is awesome! We stayed here as we were picking my sister up early from the airport. The location means the drive to the airport terminal is about 10 minutes and costs you around 100baht. The hotel rooms are perfectly fine and there are places to eat and a 7 eleven nearby. The receptionist was helpful in flagging down a taxi for us in the morning. We got very impressed starting from airport pick up by luxury van then spent one night stay at hotel. Room was excellent . They dropped us at airport (free) at 2am. to catch onward flight. Staff are very proffessional and cooperative . Nice safe comfortable stay and value for money . The hotel is very close to Suwanaphumi airport. Pick up was well organised. The room is clean, cool with adequate light. Free tea and coffee in the room. Staff were friendly. Overall sbove average for a quick night between flights. We have stayed here 5 times now because it is close to Suvarnabhumi and the hotel offers a free shuttle. The staff is always friendly, the rooms are clean and spacious, and there are restaurants and 7-11s nearby. Had a late arrival and 6am flight and needed somewhere to stay that was close to the airport. The room was very well kitted out with everything I needed. Price was also very reasonable for the quality and service. Bed was large and I'd stay here again in advance of an early flight. There was a free shuttle to the airport (looked to run every 30-40 minutes). It takes about 7 minutes. There is also a 7-11 just next door for quick essentials. Quick note: The friendly porters are always there to carry your luggage, which is very useful as there is no lift. However, if you can't do stairs I'd either ask for an accessible room or this may not be for you. Very good, very convenient. Decent, help yourself breakfast. Good car service to and from airport very short journey. Friendly, helpful staff. No lift, no good for disabled guests, too difficult for them. Limited car parking. Good rooms. Lots of local facilities for food, entertainment. Computer and doc print access for boarding cards etc. Courtesy tea, coffee, biscuits always available. We always book this hotel for airport transfer Nice and helpful staff super convenient but prepare yourself for claiming up the stairs because there have no lift. This time we a bit disappointed with the air condition wasn’t cold the toilets not flush properly and the water pressure is very poor. 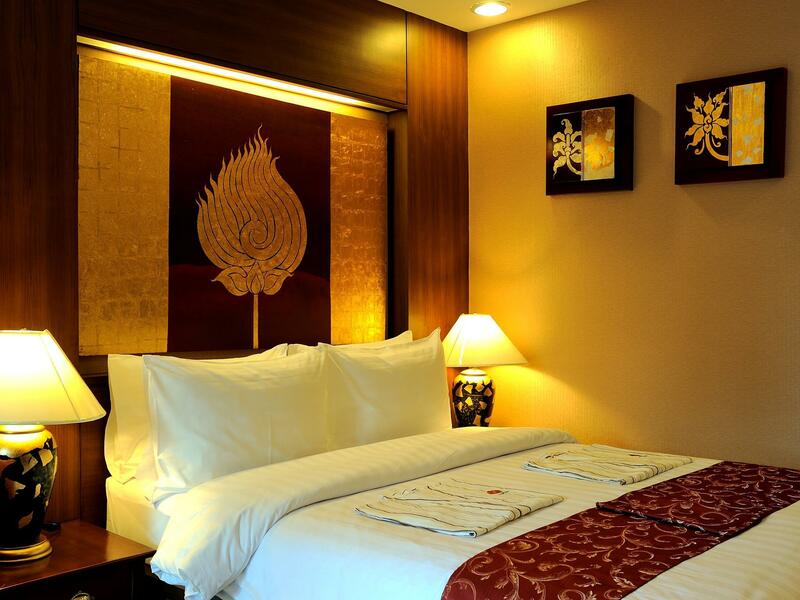 Maria Boutique Residence is the perfect spot for a solo budget traveler to spend an overnight in Bangkok and stay fairly close to the airport for a morning flight. The staff was friendly and professional and the room was perfect, simple, clean, and comfortable. Highly recommended! Only a 10 minute ride to the airport. Pickup service at the airport was easy and well organized. Many local restaurants nearby as well as a great night market only a 10 minute walk from the hotel. Clean and comfortable room and very pleasant staff. We opted for the breakfast inclusion which was very good and great value. Welcoming hotel staff, only 5 minute drive from airport. Arrived and found my name on a signboard in between doors 3 and 4; van picked us up 10 minutes later and took us to hotel. Two things you should know: there is no elevator, so if you are disabled, this is not a hotel for you. Second, the beds are very hard.